The Swiss opened up the night session in Arthur Ashe Stadium and had a relatively straightforward match against the 22-year-old. 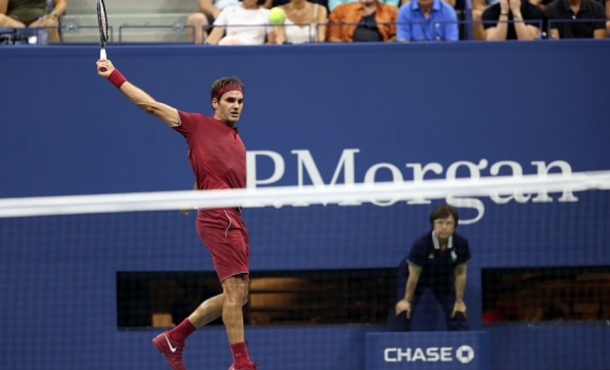 It has been a decade since Roger Federer has lifted up the title at the US Open. He kicked off his campaign to try and end that ten-year drought against Yoshihito Nishioka and found himself through comfortably against the 22-year-old Japanese player. Federer will face Benoit Paire in the second round after the Frenchman beat Dennis Novak. Nishioka looked like he was in for a relaxed hold to open the match, but it was anything but that, thanks to a couple of loose backhands which saw him get broken to start the match. The second-seeded Swiss began to use his favorite weapons, the serve and forehand, to keep him ahead before his forehand became somewhat of a letdown in the fourth game. Three straight forehand errors brought back what could have been a love hold to deuce, but it was still no problems for the five-time champion in New York, getting out to a 3-1 lead. The Japanese's game just proved to be unthreatening for the Swiss in the early stages. Another break of serve after a missed forehand volley into the net put Federer up 4-1 and would take the opening set 6-2. Nishioka's groundstrokes were quite disappointing in this match, with his backhand escaping him in the early parts of the second set. Federer continued to reel off winners for fun, both off the serve and the ground, racing out to a 4-0 lead in the second set. The 22-year-old Japanese saved set points in the seventh game of the second set, battling hard for seven minutes to extend the set. It was as simple as you expected from Federer as he continued to just hit winner after winner and force his opponent into overplaying as he was quickly out to a two sets to love lead. It all looked like it had gotten away from Nishioka, getting broken twice to start the third set. The 22-year-old finally held in the fifth game as the Arthur Ashe Stadium crowd tried to urge him on. Federer quickly dismissed the two break points he faced, holding for 5-1. It wasn't all straightforward for the Swiss though. Two more break points were saved with aces in the eighth game, and back-to-back errors off his racquet gave one of the breaks back to Nishioka. Despite the late resistance from Nishioka, Federer was just too strong in the end, taking it 6-2, 6-2, 6-4.